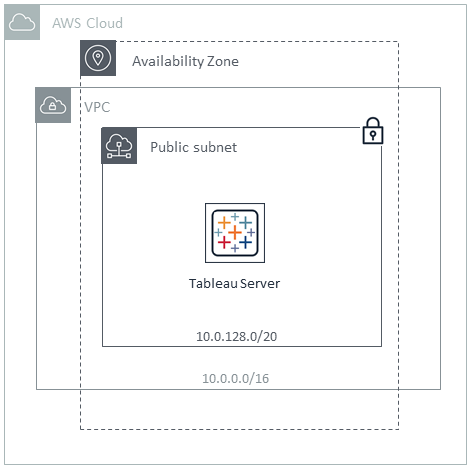 This Quick Start helps you deploy a fully functional Tableau Server environment on the Amazon Web Services (AWS) Cloud, following best practices from AWS and Tableau Software. 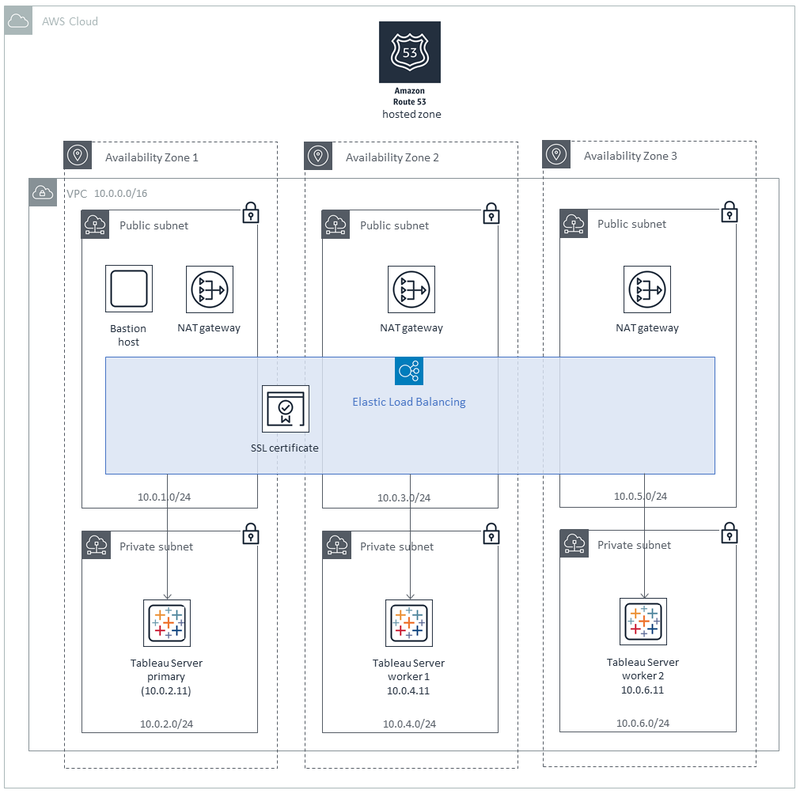 The Quick Start uses AWS CloudFormation templates to automatically deploy a standalone or cluster (distributed) architecture for Tableau Server. Both architectures can be deployed into a new or existing virtual private cloud (VPC) in your AWS account. This Quick Start was developed by Tableau Software in collaboration with AWS. Tableau Software is an APN Partner. The Tableau Server standalone (single-node) deployment installs Tableau Server on an Amazon Elastic Compute Cloud (Amazon EC2) m5.4xlarge instance running Microsoft Windows Server, CentOS, or Ubuntu Server with a 100 gibibyte (GiB) EBS volume in a new or existing VPC, in the AWS Region where you launch the Quick Start. The Tableau Server cluster (multi-node) deployment installs Tableau Server on Microsoft Windows Server, CentOS, or Ubuntu Server on at least three Amazon EC2 m4.4xlarge instances. Each instance is configured with a 100-GiB EBS volume. Optionally, you can use a Secure Sockets Layer (SSL) certificate for enhanced security. Log in to Tableau Server and test the deployment. You are responsible for the cost of the AWS services used while running this Quick Start reference deployment. There is no additional cost for using the Quick Start. For cost estimates, see the pricing pages for each AWS service you will be using. Prices are subject to change. For a standalone deployment, you can use a 14-day trial version of Tableau Server. For a cluster-based deployment, you need a user-based server license (which covers all authorized users of Tableau Server) or a core-based server license (with a minimum of 16 cores). To obtain a product key, contact sales@tableau.com.